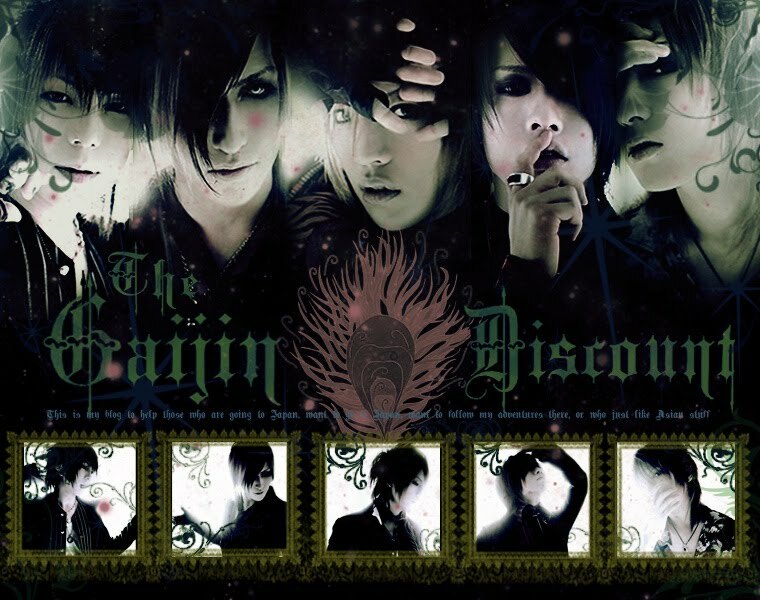 The Gaijin Discount: Today's Band: (drumroll please)........Alice Nine!!!! Today's Band: (drumroll please)........Alice Nine!!!! So naturally I'm flipping out. I just got the best news of the year when I happened to check Alice Nine's official homepage. They have, in fact, signed on to be at Vrock Fest '09 on that Saturday and I cannot honestly tell you how happy this makes me. I could just die. So, of course, alice nine will be today's band. And perhaps tomorrows, who knows. But before I go off on a huge paragraph about that, I have a housing update. The company has finally placed me with a family! They have two daughters (middle and high school) and a dog. The only bad news is, the family is a 60 min. train ride...from the college, which means a two hour ride to Tokyo which makes me sad. All the same, at least now I know something! And the company is giving me a one month grace period to complain and switch families, which is also nice. Anyways, so on to alice nine! 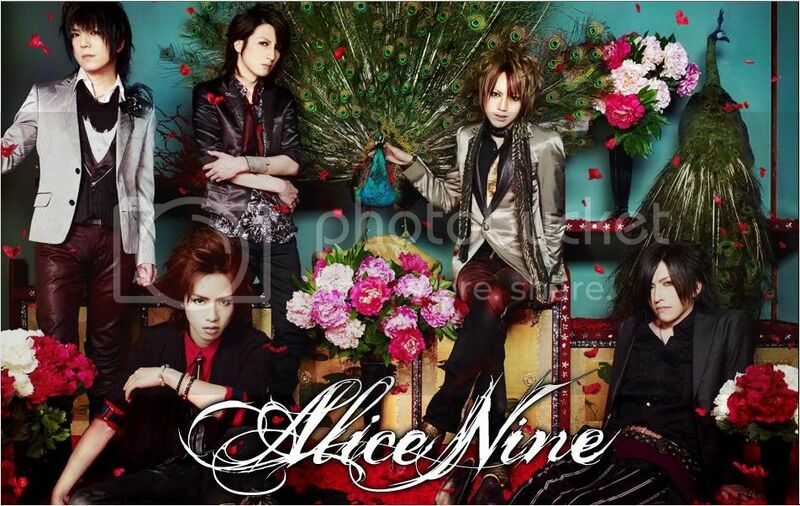 Alice Nine formed in 2004, beginning with eldest, and the official leader, Nao and progressing from there, though most were in other bands at the time of Alice Nine's creation. The young band first released two singles, selling only a set number of copies and thus, selling out, which paved the way for their first tour with fellow band (also will be at the Fest) ayabie. Shortly after, though the band was not yet a year old, they were signed under the major label PSC. The very next year, they held their first one-man (solo) concert, which was recieved well, and they showed no signs of slowing down. They continued in success, even performing in LA at the Jrock Revolution concert created by X-Japan's Yoshiki. To date they have had numerous photobooks, live DVDs , singles and full albums, as well as being regulars on all the Jrock magazines. The band suffered one setback in 2008, after kicking off their tour, when Guitarist Tora suffered from a cervical disk hernia that left him in excruciating pain and suffering from bouts of numbness. Necessarily, many of the tour dates were cancelled while the other members kept fans informed via their blogs, but in a relatively short amount of time, Tora made a recovery and they got back to business. This August they are preparing to release the single "Hana," as well as hold the last concert on their Vandalism tour, "Vandalism-Finale-," and will also be releasing another photobook to commemorate these past five years together. I think I've jabbered enough for now, and I haven't even talked about the members yet, so we're going to take a brief sabatical from the Today's Band series and do, you guessed it, an Alice Nine series for five days. Anyway, the members of alice nine are: Shou (Vocals), Nao (Drums), Tora and Hiroto (Guitar) and Saga (Bass). Today's video is Rainbows. Please excuse Shou's outfit and ridiculous glasses, and enjoy! Hooray!! I'm so glad you get to see them at the concert! Have you started counting the days yet? ?